The universe speaks through the trees and shares some insightful, inspiring answers. 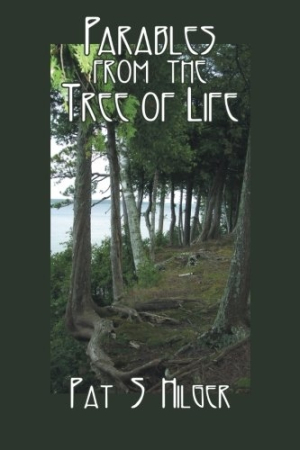 Pat S. Hilger’s debut, Parables from the Tree of Life, is a spiritual memoir in which the author takes a serene walk through her interior conversations about life’s larger questions. She asks and answers questions that will resonate with readers, whether it is a belief in God, some other higher power, or simply the power of nature that provides them with the responses that enable growth and understanding. Hilger credits the trees and God with answering her; she believes it is the universe or one’s inner wisdom that calls out the responses to questions such as why a person who goes to church daily can still be so mean. Each chapter is set up with a beautiful black-and-white photograph of a tree, taken by the author in her beloved Door County, Wisconsin. The trees are her spiritual guides, and the reader gazes up at the sky through the branches along with the author as she grows. The wisdom Hilger derives from talking out her worries is a source of comfort and clarity. However, the “responses” from the trees are printed in a light gray, which makes the reader strain to decipher the answers to questions that cross cultural, religious, and geographical boundaries. Hilger writes of performance anxiety she had as a young girl when she moved from a love of dancing by herself to performing in recitals. Her passion became a burden when it was shared publicly. When posed to the trees, they respond, “You are not alone, most people who are creative have a hard time with ‘public’ things.” The message of not being alone is repeated throughout the book as the author’s higher power reminds her that she is not alone and that she has strength, faith, and wisdom. The advice offered to counter stage fright is to forget the audience and lose oneself in artistry. In the chapter “Differences,” Hilger poses questions regarding bigotry, racism, and the fear of those who are different, sentiments that both of her parents tried to instill in her and her siblings. She is torn between honoring her parents and her sense of what is morally correct. The author knows instinctively that this way of thinking is unjust, and the trees provide the understanding of her parents’ xenophobia while simultaneously giving Hilger permission to challenge their beliefs. Parables from the Tree of Life is an inspiring read for those searching for answers to life’s larger questions. Hilger demonstrates that talking through the things that cause worry can bring positive results whether this comes from discussions with a friend, a therapist, a priest, or the universe. She says that if we put the question out there, a response will come—one that enables growth and peace.